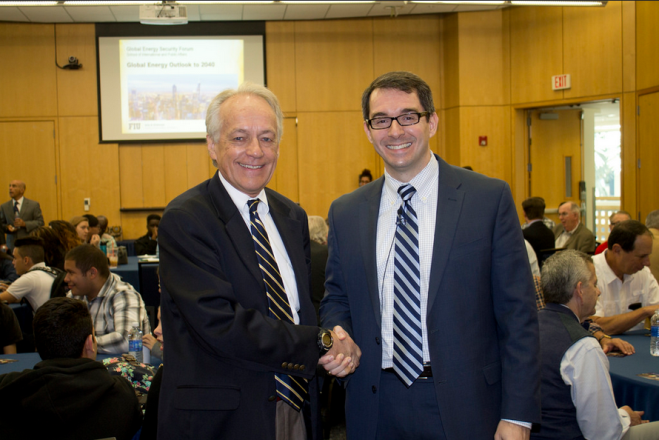 On February 3, 2015, the Global Energy Security Forum of the School of International and Public Affairs presented the Global Energy Outlook to 2040. The energy outlook has been presented annually at FIU since 2003 and has always attracted a large audience. Over 124 people attended this year’s event, including forty students from Hialeah Gardens Senior high school. ach year the half-day conference explores the global energy context within which the world will implement new energy policies. This year, Dr. Nick Jones, Energy Advisor in ExxonMobil’s Corporate Strategic Planning Department, presented an assessment of energy supply and demand through 2040. He discussed the link between economic progress and energy consumption and examined the underlying factors shaping energy supply and demand challenges around the world. His presentation also covered unconventional gas production known as “fracking,” the growing demand for power generation and what the energy industry is doing to address the twin issues of global warming and climate change. Dr. Edward Glab, Director of the Global Energy Security Forum, moderated the presentation, which was underwritten with a grant from ExxonMobil.